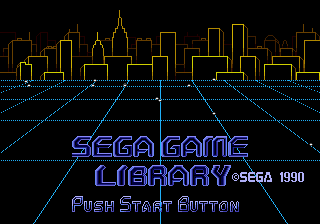 Sega Game Toshokan (セガゲーム図書館), meaning Sega Game Library, is a Sega Mega Drive cartridge distributed with select Mega Modems starting November 3rd 1990, with Putter Golf and Pyramid Magic Yokokuhen being the launch titles. With the Mega Modem connected, this cartridge in the cartridge slot, and a Sega Meganet subscription, consumers could download and play select Mega Drive games exclusively available through the service, which were released between 1990 and 1992. Two such games, Flicky and Shi no Meikyuu: Labyrinth of Death (called Fatal Labyrinth overseas), later saw retail release outside Japan. Another, Teddy Boy Blues, was a port of an earlier game that had already been released internationally on the Sega Master System. A fourth, Columns, was already released in Japan retail. All the others were never released outside Japan and originated on Game Toshokan. Many of the games were eventually rereleased as part of the Game no Kanzume series, several Sega Ages compilations, and Sega's B-Club! service for downloading Mega Drive games to play on a PC. The paid service ended in September 1992, possibly continuing for existing subscribers or as a free service until March 1993. It was said to have had 3,500 subscribers at the time that the service was announced to end. Main article: Sega Game Toshokan/Magazine articles.